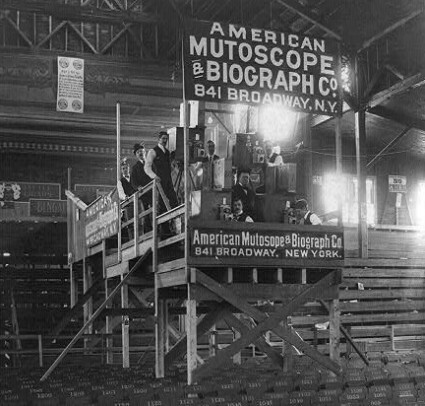 Here at the Bioscope we like to champion silent cinema in its many different forms, which has included a number of posts on newsreels. Not all readers may feel quite the same interest in early newsfilm, but there is now evidence that others are thinking along the same lines. History of Art at the University of Girona, and the Spanish Ministry of Science & Innovation Project are co-organising a two-day seminar entitled The Construction of News in Early Cinema. The seminar (which sounds near enough to a conference to me) is one of a series of seminars that have been held on the origins and history of cinema (La construcción de la realidad en el cine de los orígenes), and will be held at the Auditori Narcís de Carreras in Girona, Spain, 7-8 April 2011 (update: the dates are now 31 March-1 April). The proposed seminar will focus on trying to define the relationship between cinema and news, to see how it began to build the news imaginary that presaged many of the questions of the future news images both in the subsequent newsreels and in those that came along with the birth of television … The time period of the study is to be from 1895 up to 1914, since we believe that the newsreels underwent a different development with the outbreak of World War I. The proposal of the seminar is to establish a methodology of research and reflection in the context of news and, eventually, to find out how and if we can talk about a kind of birth of the documentary image. participants their research into pre-cinema and early cinema. – Terminological approaches. What do we talk about when we talk about news event films, or newsreels in the field of early cinema? How can we define the images that recorded contemporary events that became part of the framework of newsworthiness established by the press? At what point in time can we start talking about newreels? – Precedents in the concept of news. Cinema began as a place of intermediality that brought together work from various forms of expressive media. From this point of view, we want to see how the concept of current events was present in such spectacles as the magic lantern shows, panoramas, illustrated journals and illustrated vignettes or how it took on a key role in the construction of the collective imaginary in Wax Museums. Also significant at the time was the idea of Teatro por horas (popular hour-long performances) that included representations of contemporary issues. Another precedent in current affairs worth studying was photojournalism and its relationship with cinematographic news. – Limits of the notion of current affairs. The inclusion of filmic images into what was real entails research not only into news, but also into the construction of the touristic imaginary and the documentation of the industrial world. Given these premises, we are interested in defining what the limits of current affairs really are. What is considered an event? When and how long did an event remain current at the beginning of the century? – Cinematographic news models: films of real events, images of war, royal visits, official openings, fashion events, festivals and sporting events. We have to consider that the field of filming sports events is of fundamental importance in developing the image of events in general and the subsequent setup of live television. Early cinema included frequent showings of boxing matches. – Re-enactments news. We want to see how certain news items were re-enacted, how the staging of the scene is achieved, which elements document the truth and which are fictional. – The role of the lecturers accompanying the news presentations. Did the figure of the lecturer appear when news was projected? Which was his role? – The relationship between the written and the graphic press. Establishing a bridge between what the pictures show and what the press of the time explained. Analysis of the development of cinema as information from the perspective of the history of the press. – The position of the camera with regard to the event: the point of view of the camera and the staging with regard to royal visits and displays of authority. When does the camera arrive after an event has occurred? How was more than one camera used to film certain sporting events? Who were the historical personalities who believed in the power of the camera and wanted to be filmed in order to increase their fame and the other personalities who did not? – The contexts of the audiences: how were the cinematographic news shows of the time received? Was there a relationship between what the viewer believed and the hypothetical “truth” of images? What was the timing involved in showing news events? Were there incidents or events that could be seen the next day since they were processed and shown quickly? How can we relate the timing of early cinema with the search for live events that were subsequently carried out on television? – What was lacking in cinematographic news? The images built up a highly specific reality througha series of ideological factors: race, power, colonialism, sexism, etc. What historical events were not shown? What was outside the field of news? What was the relationship between political censorship and news? – The regular newscasts. The newsreels of Pathé Frères began to be screened regularly in 1908. A study of the Pathé model and how it was received in the context of the period. – Reusing contemporary news events in film making. Films such as “The Fall of the Romanov Dynasty” (Esfir Shub, 1927) and “Paris, 1900” (Nicole Vedrès, 1948) are films that were put together using news items from before 1914. What significance did the images have in the compilation of documentaries made during the time period? Summaries should be no more than 60 lines, to be emailed to institutestudis@museudelcinema.cat, following the guidelines set out in the full call for papers. Papers can be given in Catalan, Spanish or English. It is expected that papers presented at the seminar will be published, “provided that they have been defended by the author during the seminar”. So there you go. If you do attend, you’ll see me there as a guest speaker.